Will My Cousin Become Extinct Just Because He Wears A Kilt? 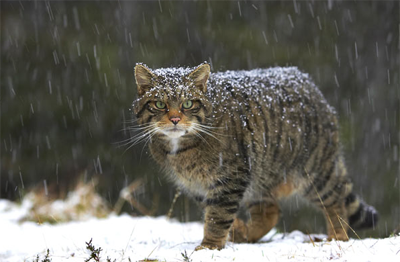 The elusive Highland Tiger, or Scottish Wildcat, is in terrible decline up in the wild high bits of Jockland and it isn’t only because the weather is sever and it’s so cold that you run a daily risk of freezing your danglies off. Apparently the biggest problem for that the shy Highland Tiger or Scottish Wild Cat is that people just don’t know he exists, or that is what so called experts on the aforementioned Wild Cat think. Seems a bit of an odd theory to this Cat because in my experience as soon as humans know that a species exist they either find excuses to hunt the poor animal or if they are Chinese they want to chop bits off it to make them sexier. So here is a picture of the Scottish Wild Cat or now more trendily named Highland Tiger so that when you are wandering the wastes of Jockland you will recognise him immediately although because he is Scottish he might occasionally be wearing a tartan skirt. He is really rather good looking isn’t he and if I may say so looks a lot like me, there now you care for him don’t you!